Dark Tower Song Arrives, Is the Trailer Coming Soon? Last fall, the trailer for Sony's highly-anticipated The Dark Tower was supposed to debut during Entertainment Weekly's first annual PopFest. That never happened, with an unfinished version of The Dark Tower trailer leaking early online. Now, with just over five months left until this highly-anticipated adaptation hits theaters in July, it seems we may finally be getting the first trailer very soon. Although an official date for the trailer launch has not been set.There has been a new song released through Spotify, which is from the Dark Tower movie trailer, and it has many suspecting that the trailer is just around the corner. A Birth.Movies.Death reader alerted the site to a new single by L'Orchestra Cinematique entitled "Behind Blue Eyes," a cover of The Who's classic song of the same name, with accompanying artwork revealing that this song is from The Dark Tower trailer. This is also the same song that was attached to the leaked trailer from October, which had unfinished special effects, and wasn't received well by the fan community. It hasn't been confirmed if we'll be getting a completely new trailer, or merely the same footage from the leaked trailer with finished effects. 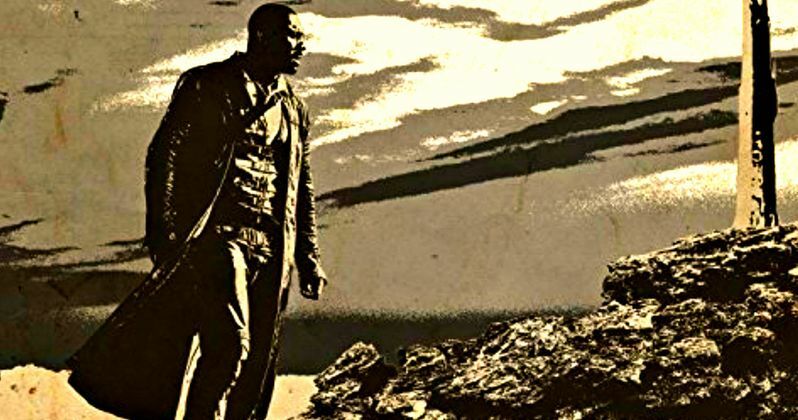 Just a few weeks after the trailer leak, Sony Pictures pushed The Dark Tower release date from February 17, 2017 to July 28, 2017, giving the filmmakers more time to complete the effects and the rest of the post-production work. The film was originally slated to go up against The Great Wall, A Cure For Wellness and Fist Fight on February 17, but now it will square off against Focus Features' The Coldest City as well as Paramount's documentary An Inconvenient Sequel, a follow-up to the critically-acclaimed An Inconvenient Truth. When this adaptation was first set at Universal Pictures, the plan was for the studio to distribute a movie trilogy, with NBC to air two seasons of a limited TV series in between the movies, to flesh out the world from Stephen King's books even more. When the project shifted to Sony Pictures, the studio teamed with Media Rights Capital to co-finance both the trilogy and the Dark Tower TV series, but we haven't heard much about the series since then. Ron Howard teased during an interview in September that the TV show is still in development, but he doesn't know where the series may land at this time. Idris Elba and Matthew McConaughey lead a cast as Roland "The Gunslinger" Deschain and Randall "The Man in Black" Flagg. The cast also includes Jackie Earle Haley, Abbey Lee, Tom Taylor, Katheryn Winnick and Michael Barbieri. Nikolaj Arcel directs from a screenplay he co-wrote with Akiva Goldsman, Anders Thomas Jensen and Jeff Pinkner. If you have a Spotify subscription, you can listen to this song from The Dark Tower trailer below, as we wait for more updates on this highly-anticipated adaptation.